Hanoi (VNA) – Mozambique’s Prime Minister Carlos Agostinho do Rosario has called upon Vietnamese businesses to engage more in trade, oil and gas, marine transport, and processing farm produce and seafood to soon realise the trade target set by the two countries’ leaders. Rosario, who is paying an official visit to Vietnam for the first time from July 31 to August 3, made the appeal during his talks with Prime Minister Nguyen Xuan Phuc in Hanoi on August 1. The host described the visit as an important milestone in the bilateral relations after the visit to Mozambique by former President Truong Tan Sang in March 2016. The two Government leaders expressed their satisfaction at the growing traditional friendship between Vietnam and Mozambique. Regarding political ties, they agreed to maintain delegation exchanges at all levels while coordinating and supporting each other at international forums. They discussed challenges in security, politics and economics along with regional and global issues of mutual concerns. The two sides pledged to contribute to the maintenance of peace and cooperation in the region and beyond on the basis of respecting international law and addressing any disputes via peaceful means and in line with international law. PM Phuc proposed Mozambique support Vietnam to become a non-permanent member of the UN Security Council in the 2020-2021 tenure and the Director-General of the UN Educational, Scientific and Cultural Organisation (UNESCO) in the 2017-2021 tenure. Pertaining to trade, investment and development cooperation, the PMs expressed their pleasure at the effective operation of Movitel, a joint venture between Vietnam’s military-run telecom group Viettel and Mozambique’s investment company SPI, as well as Vietnam’s food crop development research cooperation project in Mozambique. 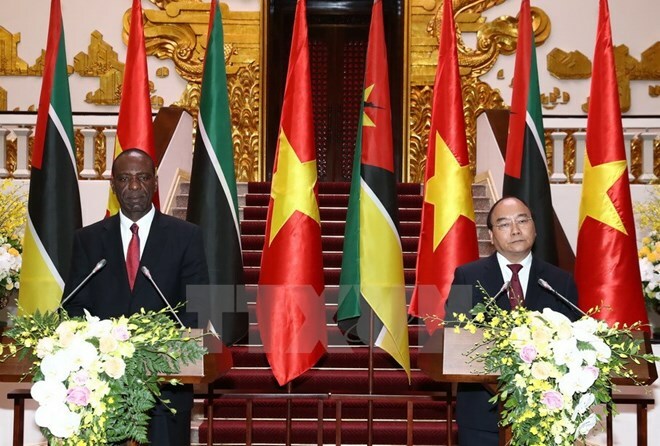 Mozambique is expected to become a leading partner of Vietnam in southern Sahara, Africa, while Vietnam will serve as a bridge to connect Mozambique with the Southeast Asian region. Vietnam agreed to share more development experience with Mozambique in the fields of natural disaster prevention, weather forecast, climate change adaptation, education-training, expert exchanges, and security-defense. The Southeast Asian country asked Mozambique to make it easier for Vietnamese businesses to open a bonded warehouse, develop goods distribution channels, and improve the legal framework for foreign investors.